Our Mighty Lions join the Bully Free Run to kick off the Olweus Anti-bullying Campaign on April 12, 2019. Renaissance Leaders run the entire assembly and honor hundreds of Mighty Lions on April 12, 2019. Ms. Severiano has been named Monroe Elementary School's April Teacher of the Month at the MUSD Board Meeting on April 10, 2019. Monroe Lions placed at Monrovia Council PTA's Reflections Program. MonroeBots are recognized for participating in the 1st elementary robotics program at the MUSD Board Meeting on April 10, 2019. Mighty Lion paints with resident artist Shanon Fitzpatrick. MonroeBots enjoy building and programming in the fun and educational Robotics program! Monroe PTA President Cissie Andrews is honored and receives a Golden Apple award for her volunteer service to the Monroe community. Read Across Monrovia 2019: Monrovia Principal Flint Fertig reads to the Monroe Lions. Teachers and staff dressed crazy on March 6, 2019, for fundraising 15K in Monroe Jog-a-Thon! Monroe FIRST Lego League Robotics Pilot Program was launched on February 6, 2019. Dancing Scientist Assembly on November 2, 2018. PTA President Cissie Andrews at Camp Pali. Operation Recess: October 15, 2018. Monrovia BMW donates school supplies to Monroe students and teachers! Kindergarten Promotion Ceremony: June 4, 2018. Heritage Project: DI student Amelia gave a cultural presentation about her ancestry in Spanish. Congratulations!! Monroe Lions took 2nd and 3rd place at the districtwide 3rd Grade Math Bee! Monrovia Reads at Monroe on March 1, 2018. The Monrovia Reads Bus will be at Monroe on Thursdays after school! The TK students enjoy making mud pie at the Monroe Garden. Assembled by Dairy Council: Mighty Lions learn all about cows from Mobile Dairy Classroom! Red Ribbon Week Oct. 23-27, 2017. These paintings feature the art of Mighty Lions. Student performances at Monroe's annual Fiesta. Kinder students releasing butterflies in our school's garden. Monroe's Florclorico Dance Group at MUSD's 2017 February Board Meeting. Although the invention of technology has spurred ingenuity, led to global communication, and changed the way that people interact with the world, it has also created some challenges and risks for children who use these communication devices. Over the past 3 years, I’ve seen an increase in the use of technology and exposure to inappropriate content during non-school hours. Many times, these online exchanges lead to disruptions of school activities, student conflict, and emotional distress. If your child has a device--phone, tablet, laptop, video game console (PS4), X-Box, or any other communication device connected to the world-wide-web, I urge you to limit their screen time and to regularly monitor their content and the nature of their usage. Below is a helpful resource for parents. 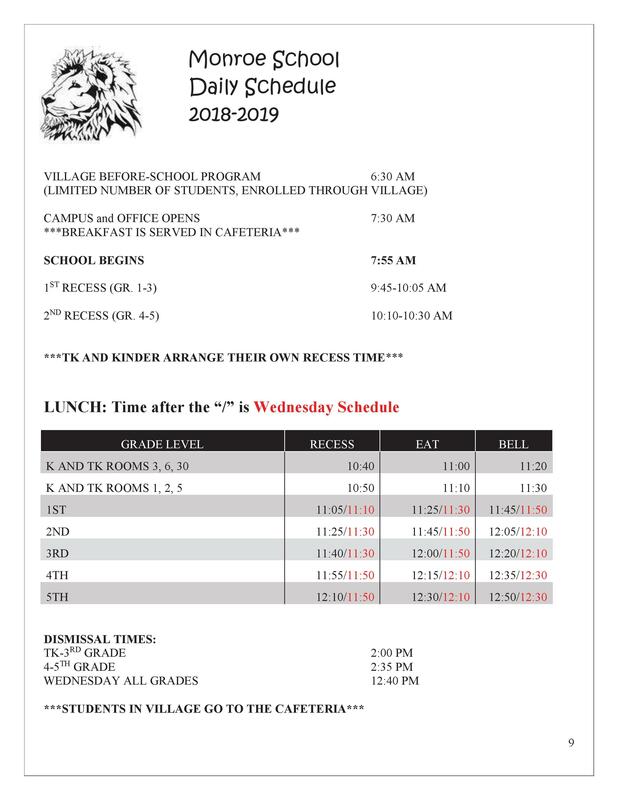 Saturday School: 8:00 AM - 12:00 PM on May 4, 2019. Fiesta and Silent Auction: 4 PM - 7 PM on Friday, April 26, 2019. You won't want to miss this night of family fun including a DJ, prizes, student performances, carnival games, inflatables, silent auction, and so much more. This year, you can bid straight from your smartphone, or even from your computer if you are unable to attend the event! Check out the auction site! Auction NOW LIVE ONLINE and will close at 6 pm on Friday, April 26, 2019.